Stream Restoration | Geo-Technology Associates, Inc.
With new land development, utility construction and the need to upgrade or replace public infrastructure, impacts to natural resources such as streams and wetlands are often unavoidable. Agency permitted stream and wetland impacts often require compensatory mitigation to be fulfilled before projects can move forward. GTA’s use of natural and traditional stream design, bioengineering, wetland creation/enhancement and the implementation of Best Management Practices (BMPs) for stormwater runoff are tools that can be utilized to restore aquatic habitats within the stream corridors, floodplains and wetland ecosystems. GTA’s experienced restoration staff utilize these tools in evaluating and designing environmentally sound and innovative solutions to meet the needs of each complex stream corridor, wetland or water quality improvement projects with a high level of service excellence and quick response that our clients expect. GTA’s multidisciplinary team of professionals are able to provide clients with turnkey project execution including topographic surveying, engineering/design, construction administration/observation, landscape observation, and monitoring services. 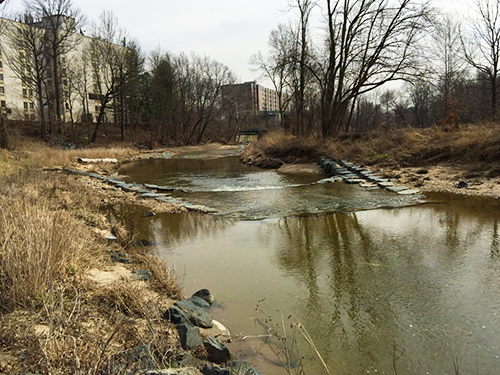 GTA obtained state and federal wetland permits for permanent impacts to intermittent streams from development of the 175-acre Riverside East Business Park property in Belcamp, Maryland. The owner agreed to compensatory mitigation through the preservation of 26-acres of nontidal forested wetlands and restoration of a section of an intermittent stream channel. 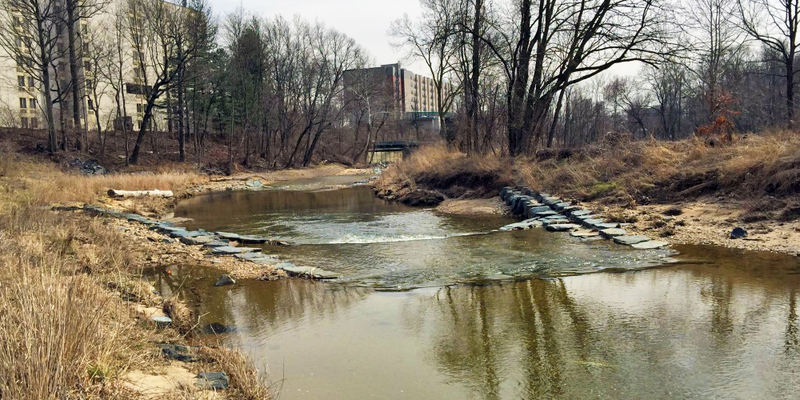 In addition to wetland delineation and permitting services, GTA provided stream restoration design, construction observation and project management for a 75-foot section of severely degraded and eroded channel that flows into the preserved wetland area. 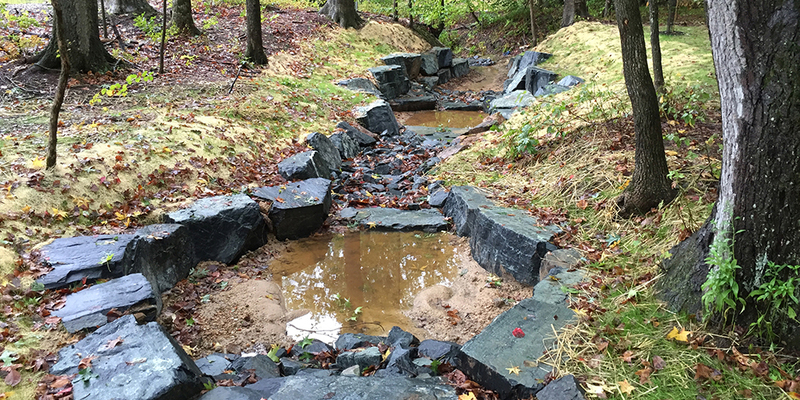 The restoration project included the grading and the installation of imbricated rip-rap toe rock around two eroded stream bends to minimize further scouring and erosion during storm events. The area adjacent to the restored stream was planted with herbaceous and woody riparian vegetation to provide a stable and more attractive looking channel. GTA performed wetland delineation, permitting, and stream restoration services for the 52-acre Rogers Ford residential development. GTA obtained USACE and MDE authorization for impacts to wetland buffer, wetlands, and waters of the U.S. 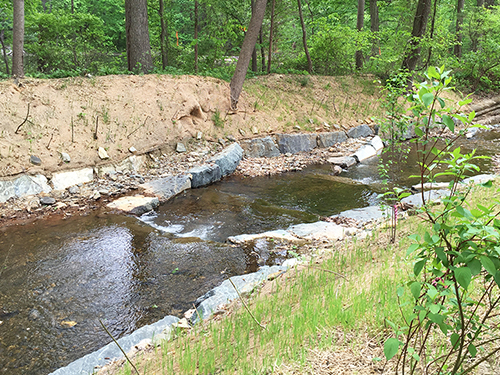 This project was completed as part of a compensatory mitigation package for permanent road and utility line crossing impacts to streams on the Rogers Ford Residential Development located in Harford County, Maryland. 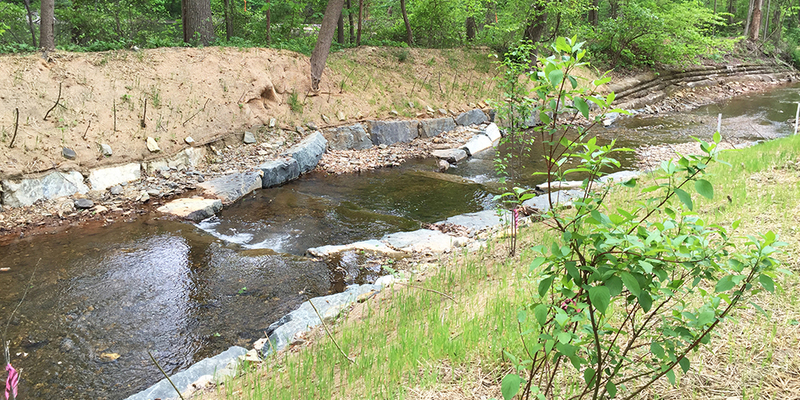 GTA provided stream restoration design, construction observation and project management for the restoration of approximately 360 feet of severely degraded and eroded channel on the residential subdivision property. 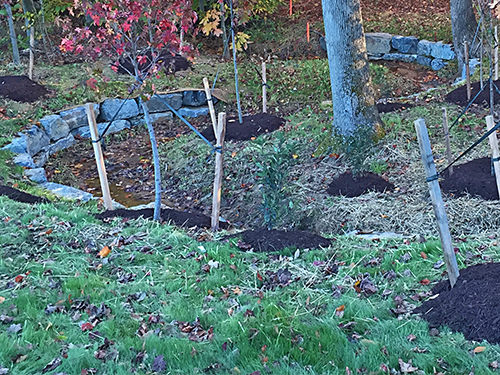 The restoration project included the grading and the installation of imbricated rip-rap toe rock and the installation of several step pools to prevent scouring and erosion during storm events. 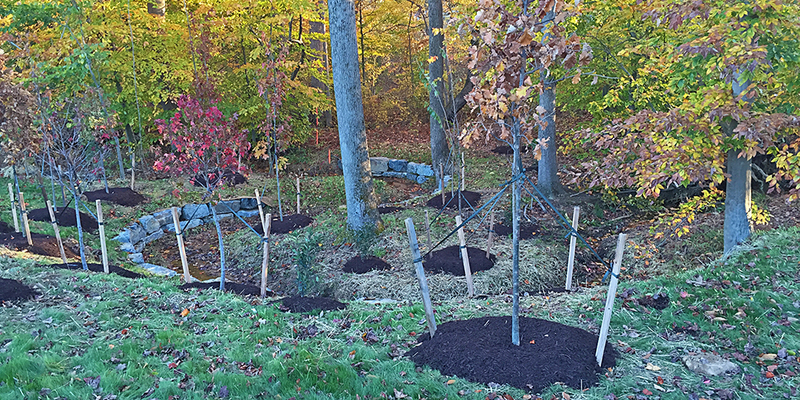 The areas adjacent to the restored stream were also planted with herbaceous and woody riparian vegetation and live stakes to help further stabilize the unnamed tributary of Fosters Branch that flows through a forested area. This project included the relocation of approximately 550 linear feet of Paint Branch 100 feet westward into a county park to protect a severely eroded, 25-foot cliff adjacent to the Comfort Inn hotel parking lot which required stabilization. GTA provided a geotechnical investigation and engineering to remediate slope failure in Potomac Clays that was more than 20 feet high and 200 feet in length, along the stream. GTA also provided wetland permitting and forest conservation submittals required for the stream restoration; extensive coordination with the County and the Corps of Engineers, who had existing plans to restore a larger section of the degraded urban waterway; and assisted the client in bid solicitation and selection of a contractor. 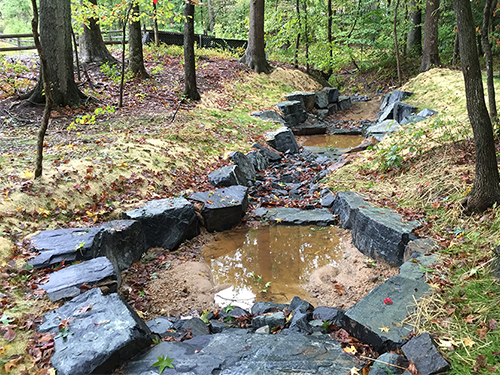 GTA provided stream restoration design, construction observation and management for a 940-foot section of severely degraded and eroded channel that was historically relocated to construct a potable water reservoir for the Town of Perryville, Maryland. Due to the existing degraded channel being located between the reservoir’s berm to the north and private property to the south, there was no room to relocate the stream to a more natural channel and restoration and stabilization practices were restricted to occur along the existing alignment. To remedy the precarious situation, GTA strategically designed rock vane structures to replace a previous gabion basket structure. The previous gabion structures were failing and began to scour and erode the impoundment berm adjacent to the stream. Where eroded banks and a previous 2.5 to 3.0-foot drop in elevation existed, GTA installed a series of rock cross vane step pools (double and single drop vanes with 0.5-foot elevation drop) spaced out at one channel width apart to accommodate for slope. The step pool rock vane structures now provide continued grade control while helping to step down the flow. An imbricated rip-rap wall was also installed and keyed into the eroding impoundment berm located on the stream’s left bank to protect the integrity of the berm and prevent further scouring and erosion during storm events. Already storm tested, the stream is functionally restored and its adjacent buffer was planted with herbaceous and woody riparian vegetation.